The bamboo flute makers of Ban Lao or Bang Sai Kai, as it's officially known, are descendants of migrants from Laos who have settled in Thailand more than 220 years ago, in old Thonburi just before Bangkok became the capital of Thailand. In 1778, King Taksin of Thonburi tasked his ablest general Chao Phraya Chakri to attack Vientiane in present day Laos. 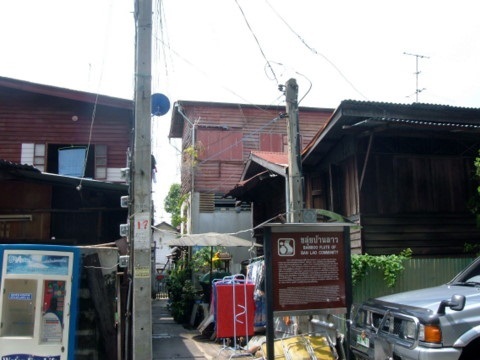 When the city fell, hundreds of Lao families were forcibly resettled in Thonburi. The Lao settlers built their homes near Khlong Bang Sai Kai. and engaged in agriculture and trade.They were also gifted musicians in the khlui (flute) and kaan (bamboo organ). That was the birth of Ban Lao (Laos Community) or Bang Sai Kai. A further military expedition to quell a rebellion in Vientiane in the reign of King Rama III brought back more Lao, who were resettled in Saraburi and Thonburi. Many became musicians in the royal palace and didn’t become bamboo flute makers until much later.In the reign of King Rama IV the overwhelming popularity of Lao music and musical instruments threatened to overshadow Thai music. A royal decree was issued prohibiting the Lao from playing their musical instruments. That’s when they turned to making bamboo flutes instead, an instrument as old as music. The wisdom of this cultural heritage of more than two centuries has been preserved to the present day in Ban Lao. Please see map to the bamboo flute makers of Ban Lao. As I walked down the road leading to Ban Lao, I asked the first group of villagers for the location of the bamboo flute maker's house. "Which house? Many households here make flutes." Then I realized it's a community of bamboo flutes makers, several households! This is evident from the piles of bamboo stacked by the lane leading to the homes. A pleasant and friendly atmosphere pervades the neighbourhood. Everyone knows everyone else. When I mentioned Khun Jarin, they pointed further down the lane. "Khun Jarin isn't here. His daughter's in the shop." The significance of that remark didn't sink in yet. When I approached another group of neighbors and asked for Khun Jarin's home, a middle aged lady sprang to her feet and identified herself as his daughter. She invited me to her home and workshop. This is her story. 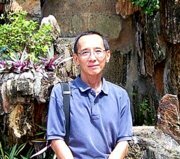 Sadly, Khun Jarin the master craftsman, passed away in 2006 at the age of 77. As the eldest in the family, Khun Nitaya has continued with the family tradition in the very house where she was born. She spoke fondly of her neighborhood that's more than 220 years old and glowed with pride when she mentioned that Wat Bang Sai Kai, the neighborhood temple, was built by the Lao community. Then she spoke of her main passion; the craft of the bamboo flute makers. It all starts in Saraburi, a province 100 km north-east of Bangkok, the source of raw material for the bamboo flute makers. The bamboo comes from the foothills in the famous district Phra Phuttabhat where Buddha left his footprint. Bamboo is cut and dried in the sun for 7 -14 days in the hot season and longer during the rainy or cool season. The bamboo has to be turned over continuously to ensure thorough drying until they turn from green to an even light brown. Next the bamboo is cut to various lengths based on the type of flute required; shorter lengths for a higher pitch and longer for a lower pitch. The eyelet at the bamboo joint is cut away. Polishing of the bamboo tubes is carefully done with grounded bricks covered by the sheath of the young coconut fruit. Designs on the surface are made by skilfully applying a ladle dipped in molten lead. To demonstrate, Khun Nitaya deftly applied some molten lead down the length of a bamboo flute to create the designs. The designs depend on the rhythm and skill of the craftsman, a reflection of his or her personal artwork and style. Holes in the flute are then drilled based on precise dimensions and spacing. The flute is filled with bees' wax and a heated rod is inserted through to melt the wax. This coats the uneven inner surface with a layer of wax which hardens on drying. A consistency of sound is ensured. On completion the holes are cleared of wax. Flutes aren't confined to bamboo. With the advent of mechanical drills, flutes were made from solid wood and later PVC tubes. These bamboo flutes are made to order and sold nation wide to individual musicians and shops selling musical instruments. What about the future of the bamboo flute makers? Who is going to take over from her? All her children, nephews and nieces were trained in the skills but who will continue? The most likely person is her 19 year old son who is a professional musician. Yes, he plays the flute. Khun Nitaya's love for her work is clear as she showed me various flutes and sportingly played a few bars on one of them. Lastly, she provided me with a booklet on details of the flute making process, the types of wood used, the types of flutes, the finer points in adjusting the sounds of the finished flute and the history of her community. This document is virtually a comprehensive bamboo flute makers manual. But it's going to take more than just a manual to acquire this centuries-old handicraft. It's got to be in your blood. I must record my deepest appreciation to Khun Nitaya for her admirably warm hospitality. She displayed a deep pride in her profession and willingly provided me with all the information on the craft and tradition of the bamboo flute makers of Ban Laos. I first visited Ban Laos in 2007. On 28 September 2010, I made my second visit and met Khun Nitaya again. She kindly presented me with an updated copy of the history of Ban Laos and flute making personally prepared by her. The contents of this page have been updated accordingly. 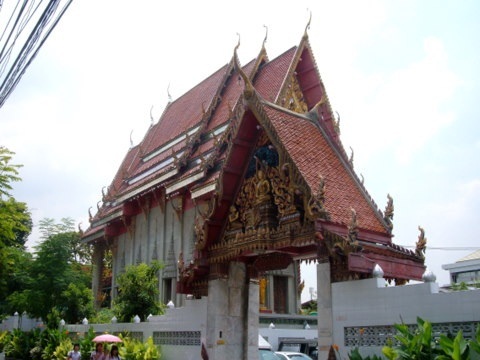 The first Laotian settlers came to Bang Sai Kai in the Thonburi era. The second wave was in the reign of King Rama III. Go round Wong Wian Yai and turn into Prachathipok Road. After 500 m turn left at the first traffic junction (Ban Khek) into Itsaraphap Road. Continue along Itsaraphap Road and turn left into Soi Itsaraphap 15. 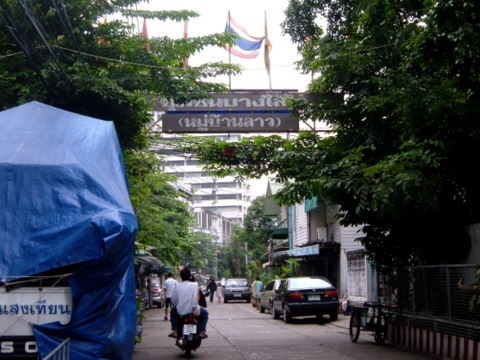 Walk along Soi 15 till you pass the Rajabhat Institute on your left. Turn into the little lane on the left just after the institute. Wat Bang Sai Kai is on the right. Keep on walking till you see the brown tourist signboard on the bamboo flute makers. Once you're here, just ask anyone for Khun Nitaya's house. Two air-conditioned bus services from the city pass Itsaraphap Road. Lat Ya Road - Wong Wian Yai - Prachathipok Road - Itsaraphap Road. Bus no. 177 Victory Monument - Ratcathewi – Mah Boon Khong - Chulalongkorn University - Silom Road - Taksin Bridge - Wong Wian Yai - Itsaraphap Road. Ban Laos the home of the bamboo flute makers is open to visitors every day. Opening hours are from 0800 – 1700 hours. Please call before visiting. To return to Traditional Thai Art and for other Bangkok Communities engaged in traditional Thai art.